Gamblogger: Frosty New Ice Crystals Slot Now at Slotland -- Get a $17 Freebie to Try It! 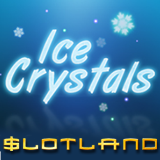 Frosty New Ice Crystals Slot Now at Slotland -- Get a $17 Freebie to Try It! Slotland has just added the glittering new Ice Crystals to its collection of unique online slots. The frosty new game has a “Trailing Wild” that expands to cover one more row after every winning spin. Two “Premium” symbols offer extra big payouts if you bet more than 200 coins. Until Decemb er 12, 2017 you can get a $17 freebie to try the new game. A choice of deposit bonuses with various wagering requirements is also available. After each winning spin, Ice Crystal’s Wild symbol -- a frozen W -- expands to also cover one more row in the reel for the next spin. Each time it expands its win multiplier increases. You can bet 50 to 1000 coins per spin. Each coin is $.01 so you can bet from $.50 to $10 per spin. When you bet more than 200 coins, a special Premium Symbol is activated. The gleaming purple Snowflake can pay out up to 100X! Introductory casino bonuses including a $17 freebie are available December 6 - 12, 2017. ICE CRYSTALS: INTRODUCTORY CASINO BONUSESAvailable December 6 – 12, 2017 only. 17X wagering requirement, 6X max. cash-out; valid for Ice Crystals only. Wagering requirement 20X; valid for Ice Crystals only. May be claimed twice per day. Wagering requirement 17X. Valid for all slots, Keno and progressive jackpot games. May be claimed three times per day. Wagering requirement 10X. Valid for all slots, Keno and progressive jackpot games. May be claimed twice per day. Wagering requirement 10X. Valid for all video poker games. Now in its 20th year entertaining players all over the world, Slotland has more than 60 unique casino games. Bitcoins are now a convenient option for deposits and withdrawals. New players are welcomed with up to $1000 in bonuses and frequent players enjoy generous VIP benefits.